Jamie Reno, an award-winning journalist and an 11-year survivor of stage IV non-Hodgkin’s lymphoma, has written a book about the resilience of the human spirit. 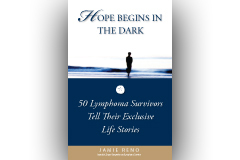 Hope Begins in the Dark chronicles the lives of 50 lymphoma survivors, revealing their exclusive stories. The book speaks of the frailty of our existence as human beings and the lengths that we will go to in order to maintain a certain semblance of a quality of life. Lymphoma is the most common of blood cancers. It has taken the lives of such acclaimed personalities as baseball great Roger Maris, former First Lady Jackie Kennedy Onassis, country western icon Gene Autry, and flying legend Charles Lindbergh. Jamie Reno’s book speaks of the triumphs of other noted personalities who successfully overcame this affliction, namely Microsoft co-founder Paul Allen, baseball star Andres Galarraga, and sportscaster Ernie Johnson of NBA basketball telecast fame. As a cancer survivor myself, having overcome a lower-grade of cancer known as leiomyosarcoma, I can certainly relate to the anguished feelings and emotions of Jamie Reno and the other cancer survivors in his book. His is a story of the determination and will to fight and overcome an affliction that invariably leads to chemotherapy, and/or an assortment of clinical trials just to stay alive. Mr. Reno’s book gives a candid inside look at those directly affected by this affliction, in the most human of terms. It speaks of our innate vulnerability to conditions of science and medicine, and our capacity to overcome those conditions. The people in Jamie Reno’s book all share a strong will to live and have made their own informed decisions about their cancer treatment, just as I did with my cancer, leiomyosarcoma. In my particular case, I was spared the nausea, hair loss and weakness invariably brought about by chemotherapy. It was only by the grace of God that I did not have to undergo chemotherapy. Although Reno’s book is about the trials and tribulations of those afflicted with lymphoma, it could just as well be about any other life-threatening condition or situation, as it delves into how those impacted are determined to fight and overcome the challenges that they face. Mr. Reno’s book also speaks of the realization of those afflicted with life-threatening illnesses or diseases that life as we know it is precious--and that we should endeavor to live and enjoy it to our fullest. Out of the mouths of babes! Maddox spoke of the pain and discomfort of having to take shots in his leg and of the overall impact of chemotherapy treatments. Yet it is clear that he is so very thankful to be alive. Maddox handled his cancer and treatment much better than I and other similarly situated adults. At my last examination, which included a colonoscopy and an endoscopy, I actually feared the worst and found myself near tears at the prospect of my doctor giving me news of a recurrence of cancer. Fortunately I was actually given a clean bill of health. We can all learn from Maddox, and from Reno’s inspirational words. Published in close association with Vital Options International in 2008 and made possible through an educational grant by GlaxoSmithKline, Hope Begins In The Dark is a testament to our will to live, which I highly recommend. Dennis Moore is a member of the San Diego Writers/Editors Guild, and a writer/contributor to the Baja Times Newspaper in Rosarito Beach, Mexico. 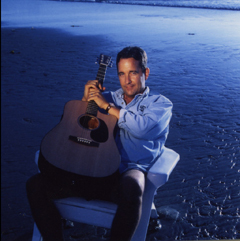 He can be contacted at contractsagency@gmail.com or you can follow him on Twitter at: @DennisMoore8. "EXCLUSIVE: Singing Star katherine Mcphee Lends Her Support"
Katherine McPhee lends her talents to Salk Intitute's groundbreaking cancer research. On August 24, 2013, McPhee, who in addition to her thriving music career is also a popular actress, headlines the 18th annual "Symphony at Salk - a Conert Under the Stars," where she'll perform with the San Diego Symphony and acclaimed guest conductormaestro Thomas Wilkens. Dr. James R. Pawlikowski saved my life! In January of 1999 I was rushed from my job at Cellular One (AT&T) by my two sons, Darius and Damien, to Hoffman Estates Medical Center in Hoffman Estates, Illinois, a western suburb of Chicago. I had been experiencing considerable pain in my stomach and vomiting, which was a recurring and ongoing condition since my earlier gunshot injury to my stomach and subsequent surgery at Illinois Masonic Medical Center in Chicago on October 21, 1979 and discharged on October 25, 1979, with the doctor (Christopher Drake) stating in his discharge summary: "This was a 28 year old male who was brought to the Emergency Room after being shot once over his abdomen, from about the right midline, and the bullet was located at the left anterior axillary line, at about T-11 level. The patient was stable. Routine workup was done; chest x-ray and abdominal views reported to be normal. The patient was subsequently taken to the Operating Room for exploratory laporatomy. The exploration was negative for any damage to the intra-abdominal organs. The patient was closed and he was taken to the Recovery Room for observation. Postoperatively, the patient did well and on the 5th postoperative day, he was tolerating oral general diet. His temperature was within normal limits, and he was discharged with an appointment to come for follow-up in the Surgical Clinic." At the time I was an Accounting Technician for the Department of Defense installation at O'Hare Airport in Chicago. Due to circumstances I was forced to come back to work sooner than I should have, right after the stitches had been taken out of my stomach. Up until the time that I had been seen and treated by Dr. Pawlikowski, I had been having these violent eruptions in my stomach, which no other doctor or hospital could actually determine the cause of. Dr. Pawlikowski did an ultrasound on my stomach and determined that there was scar tissue in my intestines, blocking the flow of food in my stomach, that was causing this problem. During the course of his observation, he also discovered that I had cancer (Leiomyosarcoma) and I was treated at the hospital for a month, being fed through a tube in my chest for one month, no solid food. Dr. Pawlikowski removed the scar tissue, and I have not had the recurrence of the vomiting that I once had due to the earlier gunshot wound and subsequent surgery. The circumstances involving Dr. Pawlikowski saving my life, actually began on the dance floor of a Chicago southside club, the Mecca Lounge, as I was dancing with my wife Sheila at a family reunion. My sister Linda, who was also dancing with her husband at the time Shedrick, got my attention and indicated to me that our mother (Dorothy Berneice Johnson) was in an altercation with another woman (Willa Mae Crenshaw). Being a dutiful son, I proceeded to walk my mother outside for some air, and Willa Mae pulled out a 22 pistol and shot twice at my mother. Fortunately she missed her back shot me in my stomach and shot another guy in the leg.Pandemonium broke out as people statred scrambling under tables to avoid being hit. When I was shot, I instinctively grabbed my stomach, and when I saw the blood I collapsed to the floor and started to pass out. I was dying! As a matter of fact, on the intake form at Illinois Masonic Medical Center, it stated: "gunshot of the abdomen - NOTIFY MEDICAL EXAMINER IF PATIENT EXPIRES." It was that serious, and I say that it was "fortunate" that I was shot instead of my mother, for I was younger and in better physical condition at the time. Once the commotion subsided some, and it was realized that I had been shot, police came and I was rushed to Roseland Community Hospital on the southside of Chicago, and the police questioned me as to if I wanted to press charges. I said no, for I understood the circumstances somewhat of the shooting, that alcohol was involved. The shooter, Willa Mae Crenshaw, was also the mother of a good friend of mine, Charles Crenshaw. They both have since passed away. I am so Blessed to still be here, and have fathered several kids since that ignominious event, Damien, Julien, Divante and Brandy. As this gunshot injury to my stomach would cause me a number of problems, both healthwise and on my job(s) many times in the future, I had a number of checkups at a number of hospitals and with doctors over the years. On December 18, 1984, a Dr. Joseph F. Giannola of Illinois Masonic Medical Center in Chicago, wrote a letter statting: "This 35 year old Black male was seen in the Surgical Clinic of Illinois Masonic Medical Center on 12/12/84 for a follow-up visit and counseling with regard to his intermittent abdominal pains. Mr. Moore was initially seen at this institution on 10/29/79 as an emergency having sustained a gun shot wound to his abdomen. The patient was taken to the operating room where an exploratory laparotomy was performed. This operation revealed no internal damage to the intra-abdominal organs. The patient made a satisfactory post-operative recovery and was discharged with arrangements for him to be follow-ed up in the outpatient surgical clinic." Dr. Giannola further stated in his letter; "Following this hospital admission, Mr. Moore has complained of intermittent bouts of abdominal pain accompanied with vomitting which has necessitated admissions to the hospital. His last admission being on 10/17/83, the patient being discharged on 10/21/83. Work-up during his hospital admissions have shown Mr. Moore to have partial or complete bowel obstruction which have resolved spontaneously with conservative medical management requiring no further surgeries. It is felt that the etiology of these episodes of bowel obstruction may well be secondary to adhesions within the abdomen, which in turn, may have resulted from his surgery in 1979." The resolving of the pain and vomitting that Dr. Giannola spoke of as being resolved by "conservative medical management," actually was accomplished by placing a tube in my nose down to my stomach, and draining the greenish fluid that had built up over time. This was actually more painful than the gunshot itself. This is something that I endured for many years, until Dr. Pawlikowski did an ultrasound and discovered scar tissue, and had it removed, albeit discovering cancer in the process. He cured me of both, and saved my life. Dr. Giannola's letter ended by stating: During his visit on 12/12/84, the above was explained to Mr. Moore and he understood fully both the nature of his abdominal problems and their implications." I understood that I went back to work too soon, after my immediate supervisor had approved advanced sick leave to recover, and a Marie Hudson went over her head and dis-approved it, without either one of them informing me. I talked with Jamie Reno over the phone today about his new book, which is a followup to his earlier Hope Begins In The Dark. He will be mailing me a copy for a followup review by me in the East County Magazine. In a related story about cancer survivors, an organization in Chicago, K.O. Breast Cancer, should be applauded for bringing awareness to this insidious disease. Dana Russell and Rashidah Moore are young social activists and entreprenuers that are bringing attention and awareness to what can be done through their website, www.kobreastcancer.org. San Diego Padres' rookie baseball player Anthony Rizzo, was diagnosed with limited stage classical Hodgkin's Lymphoma at theage of 18, but has recovered remarkably well. For six months, Rizzo underwent chemotherapy every other Tuesday. "It knocked me out until about Sunday," Rizzo said. "I'd sit in my room and do nothing. I'd tell my parents I was OK because I knew they were suffering more than me. I lost patches of hair. Every time I showered and rubbed my head, there'd be hair in my hands." After six months of treatment, doctors said Rizzo's cancer cancer was in remission. Max Sturman has written a book, "Cancer Rip-Off," which I am reviewing, that relates to Jamie Reno's subject book. Max actually questions in his book, if these survivors are actually cured, or is it something temporary. Jamie Reno's "Hope Begins In The Dark"
In today's San Diego Union-Tribune Newspaper, Staff Writer Chris Jenkins wrote an article about former San Diego Padres' baseball player Dave Roberts' fight with cancer, Hodgkin's Lymphoma. Dave Roberts was quoted in Chris Jenkins' article as stating; "Fortunately, the prognosis is very positive. We diagnosed it at a very early stage. ... Obviously, there've been tough days, going through the chemo, but there've been good days as well, and my spirits continue to be high." Dave Roberts' story is a lot like the many profiled in Jamie Reno's book, a book of cancer survivors, and their zest for life. Dave Roberts was also quoted in Chris Jenkins' article, as stating; "It was a surprise to me, I felt in relatively good health. But the more I read about it, I've learned that a lot of people in my demographic experience it." This was the first of many book reviews by me with the East County Magazine, and it has special significance for me, as I am a cancer survivor. Microsoft Co-Founder Paul Allen lost his battle recently with cancer.